Every child is different, and the same can be said about their potty training experience. Some kids simply train earlier (or later) than others. Ultimately, it’s important that parents follow a journey that works for you and your child. Around 22 months: Most children find they are poop-free at nighttime. Around 24 months: Parents should start to watch for signs of potty training readiness in their child. A very small percentage of potty prodigies will be fully trained before they are 24 months old. Unsure if your child is ready to start potty training? Take our Readiness Quiz to find out. Between 24 and 36 months: If you answered several “yes” responses to the Readiness Quiz and you’re observing behaviors that indicate you and your child can move forward, start having potty conversations with your child. Find out your child's potty personality to receive six potty training lesson plans tailored to how your child learns! Around 36 months: Most children make the potty training leap around their third birthday – 40 to 60 percent of children are completely potty trained by 36 months of age (American Family Physician). However, some children won’t be trained until after they are 31/2. In general, girls tend to complete potty training about three months earlier than boys. Between 3 and 4 years old: Your journey is not over yet. Accidents happen! They’re not a big deal – parents should expect them. Once in a while, your child may have an “oopsie” when tired or sick or when extremely occupied by something. This is a perfectly normal natural part of the learning process. Learn more about setbacks and regression. Over the age of 4: If your child is over the age of 4 and fully potty trained by day, but having three to five wet incidents at night per week, talk to your pediatrician. The doctor may diagnose nocturnal enuresis, commonly known as “bedwetting.” Learn about how GoodNites® can help ease the stress of bedwetting. Set aside your expectations. On average, it takes eight months to potty train a child, and many children take even longer. Just remember that this is a partnership. You are your child’s coach and he needs you to stay with him for the whole course! 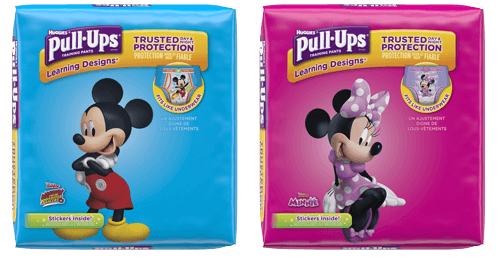 To learn more about how you can potty train your child at different ages, check out the full Pull-Ups® potty training program.